Ajay Devgn’s daughter Nysa Devgn and actress Shruti Haasan were snapped at the airport this afternoon. The Bollywood industry is full of famous stars who have a huge fan following across the nation. Well not only these stars, but their kids are also equally famous among the people. There are these star kids like Shah Rukh Khan’s son Aryan Khan, Sridevi’s daughter Jhanvi Kapoor, Amitabh Bachchan’s granddaughter Navya Naveli Nanda and such many others who have created quite a buzz in the industry, even before they have set their first foot in here. But then there are also some star kids who are shy and avoid getting clicked by the paparazzi. We have often shown you all how Akshay Kumar’s son Aarav Bhatia and Saif Ali Khan’s son Ibrahim Ali Khan try to avoid the shutterbugs. And joining the same group is Ajay Devgn and Kajol’s daughter Nysa Devgn. We recently spotted the young girl at the airport, who was so shy that she didn’t even look into the frame. Nysa was spotted in a very casual look wearing a black top and grey track pants. 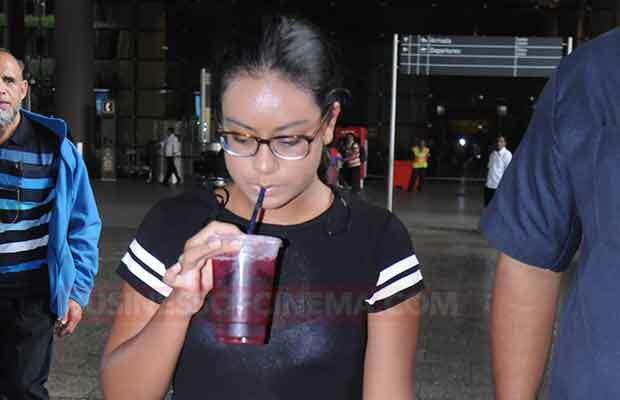 Avoiding the shutterbugs, the girl made her way out while sipping her drink. We also spotted the actress Shruti Haasan who was in smiles looking at the paparazzi. She was wearing a top with ripped blue denims. Carrying a denim jacket and white framed glasses, Shruti was looking very pretty. She was last seen in the film ‘Behen Hogi Teri’ opposite actor Rajkummar Rao. Previous articleShah Rukh Khan To Buy A T20 Team In South Africa?